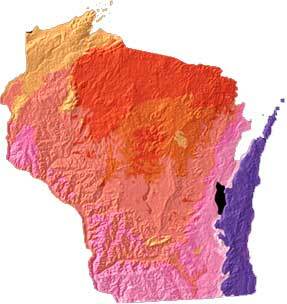 Wisconsin geology and topography map courtesy of USGS: A Tapestry of Time and Terrain. Wisconsin geology and topography map; [file:field-file-main-description] Photo by [file:field-file-photographer]/[file:field-file-source] ([file:field-file-license]). There's been conjecture and confusion about where the name "Wisconsin" came from. As with so many state names, the original native American words and languages from which the names evolved have been lost. According to the Wisconsin Historical Society, Wisconsin means "river running through a red place" (the red place referring to the red sandstone bluffs of the Wisconsin Dells); they also say the name "is the English spelling of a French version of a Miami Indian name" for the Wisconsin river (which runs 430 miles through the center of Wisconsin). Wisconsin became the 30th state on May 29, 1848. 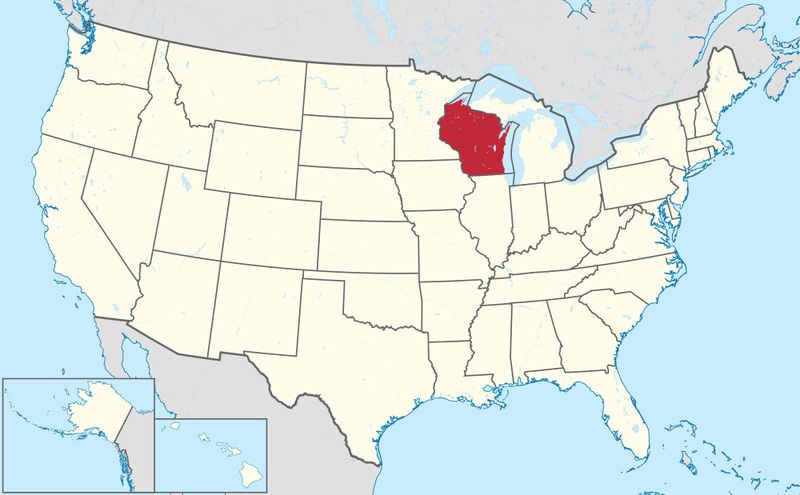 The state of Wisconsin on map of USA; Wisconsin became the 30th state in 1848. Photo by TUBS/Wikipedia (use permitted with attribution/share alike). Add Media for Origin of "Wisconsin"